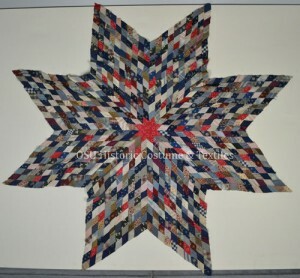 This post focuses on the tradition of quilts and, in particular, the red, white and blue star quilt top featured above. While quilting is not strictly an American past time, quilts are often seen as a quintessential piece of Americana. 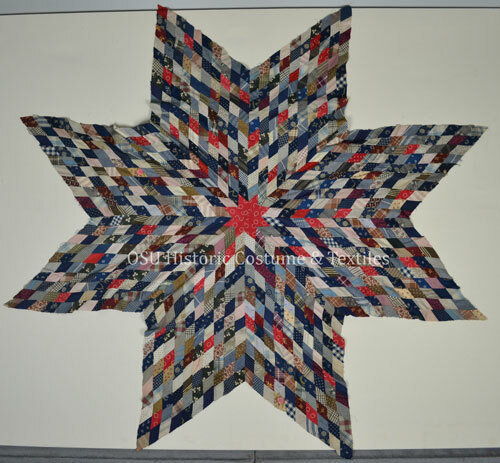 The red, white and blue quilt top featured in this post was recently rediscovered within our collection and seemed an appropriate item of discovery for Clothes Lines as we celebrate the 4th of July this week. The origins of quilting and piecing are not specifically known but probably dates from before written history. It can be certain that economy and the need for warmth were major stimuli in the development of these sewing techniques. Multiple layers of fabric sewn together are stronger and warmer than one, and fabric remnants could be pieced together rather than simply discarded. Quilts not only provided warm covers for beds, they also served as covers for drafty doors and windows. Quilting was an important part of most women’s household duties, particularly in the nineteenth century. Even after industrialization, the needs of the average family for reliable and affordable furnishings kept quilts in demand despite the availability of cheaper ready-made blankets. This was due to the fact that quilts were still economical due to the use of scraps and worn materials and were more decorative than the less expensive ready-made blankets. 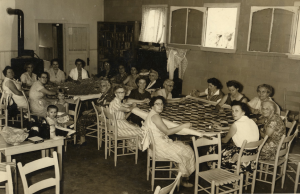 Of equal importance to the perpetuation of the quilt making tradition was the opportunity to socialize that events like the sewing bee provided. Addie Community Quilting Bee in the 1950s. Photo courtesy of the Sylva Herald and Joe McClure. Image taken from digitalheritage.org. Quilting bees combined the practical with the social. They provided women an opportunity to socialize with one another and exchange everything from recipes and quilting patterns to news and gossip. In some rural communities, the quilting bee may have been one of the only sources of social contact women had with each other. While quilting bees could be held during other times of the year, the majority of quilting bees were held during the winter. This was due to the lack of agricultural work that needed to be completed during the colder winter months. It is important to point out that many hours of work were completed prior to the bee. Women had to assemble the pieces of material, cut them into patterns and assemble them to make the “top”. It was this “top” that was then assembled by the participants in the bee into the completed quilt. Numerous quilts could be completed in a single day during a bee rather than the weeks it may take a woman to complete a single quilt on her own. The quilt featured in this post is of an unknown origin. There are no identifying documents that correspond with this artifact in the Ohio State collection. Suppositions can be made, however, based on the fabric used in its design. The bulk of the fabric pieces used to create this quilt top appear to date between 1880 and 1910. It is possible that this patriotic color palette was inspired by the centennial of Ohio’s statehood. This would date the quilt top from around 1903. This top features a “Star of Bethlehem” pattern that is unusual in that it does not have concentric circles of similar fabrics circling the center. Stars are a common motif used on quilts and the “Star of Bethlehem” is a particularly important star pattern. In its original form it is a single central star made up of eight points, sometimes measuring as much as eight to nine feet from tip to tip. A star pattern is not easy to execute. Precision is extremely important in the cutting and sewing as any inaccuracy is multiplied as pieces are added. If poorly pieced, the quilt will not lie flat when finished. An intricate star pattern was one way for a woman to show her needlework skills. This example from our collection is not particularly well executed, which may be why is was not assembled into a completed quilt. While this quilt top is beautiful, many of the pieces were cut on the bias and the overall design does not lay flat. This would make its final assembly especially challenging. Orlofsky, Patsy and Myron. Quilts in America. New York: McGraw-Hill, 1974.